The "Helens" participated in Operation E-Drop to the troops. Guest Blogger: "How To Release Your Inner Zombie" Zombie Acres. April 23 - Interviewed at International Best Selling Author Stacy Eaton's blog. May 18-Read an excerpt at KEEPING UP WITH THE RHEINLANDERS blog. 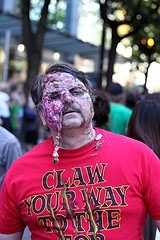 Pics from the Vancouver Zombie Walk -See you next year!